When she first got together with friends to make soup for women and children fleeing domestic abuse in Calgary, Sharon Hapton recalled how the chef at the shelter broke down in tears when she saw their delivery of kosher-style chicken soup. “The reason the chef was overcome with emotion was that there were Jewish women at the shelter at that time, and she knew how much it would mean to them,” she explained. 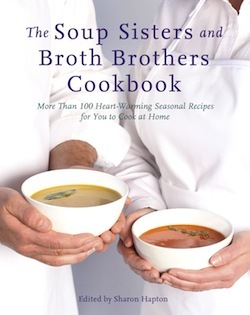 The Soup Sisters and Broth Brothers Cookbook features recipes by acclaimed B.C. chefs, including Vikram Vij, Karen Barnaby, Rob Feenie and Lesley Stowe, among others. That was five years ago and since then Hapton has been busy with Soup Sisters and Broth Brothers, her nonprofit social enterprise that organizes soup-making events in some 20 cities nationwide. She visited Vancouver on Oct. 8 to launch her second cookbook, The Soup Sisters and Broth Brothers Cookbook, featuring soup recipes by acclaimed B.C. chefs, including Vikram Vij, Karen Barnaby, Rob Feenie and Lesley Stowe, among others. Hapton’s favorite, though, is the recipe she grew up with, her mother’s potato leek soup. “There’s so much memory and nostalgia in it, it’s really delicious, simple and beautiful,” she says of the recipe. The mandate for Hapton’s organization is to nurture and nourish women and children fleeing domestic abuse and family violence and seeking shelter in some 30 shelters across the country, including those in Vancouver, Burnaby, Surrey, TriCities, Kelowna, Victoria and soon Penticton, too. Participants pay $55 to attend an event in partnership with a cooking school, where they help to make up to 200 servings of soup under the guidance of a chef facilitator. Afterwards, participants enjoy a meal of soup, salad, bread and wine with other cooks in the kitchen. “It’s a night out where you learn about the shelter you’re supporting and enjoy the camaraderie in the kitchen,” Hapton said. Ninety-five percent of the participation fee goes to the culinary partner, which supplies the ingredients and the kitchen where the soup is made. By uniting with a culinary partner the organization ensures participants will receive good service, fresh ingredients and operational excellence as they make their soup. Batches of fresh soup are delivered in containers adorned with handwritten labels. Quantities are supplied to last until the next event when soup is made, which can be up to a month away. These days, she receives emails from people all over Canada who have heard or read about the program. When new communities show an interest in starting the program, she asks to meet three main coordinators for each group and helps them implement it. “Every city, big or small, has a shelter,” she said. And many of them are now being supplied with tasty, fresh, regular batches of soup. In Vancouver, Soup Sisters supplies soup to Kate Booth House, Imouto Housing for Young Women and Koomseh transition house, in partnership with the Dirty Apron Cooking School. The next soup-making event is Jan. 25, at 11 a.m. For more information, visit soupsisters.org or email [email protected].